In American and English naming tradition, a junior (jr.) is the son of a father with the same name. Thus, with Antigone jr., the New York choreographer Trajal Harrell takes on a study of the role of Antigone from Sophocles' tragedy. It will eventually grow into a much larger work entitled Twenty Looks or Paris is Burning at the Judson Church (L). These works are part of an ongoing series, also entitled Twenty Looks or Paris is Burning at The Judson Church, that comes in five regular sizes - Extra Small (XS), Small (S), Medium known as (M)imosa, and the upcoming Large (L) and Extra Large (XL)- plus this junior size. 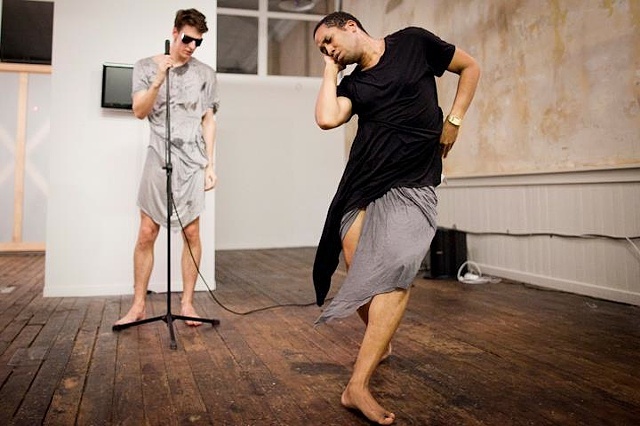 They all take on the proposition: "What would have happened in 1963 if someone from the voguing dance tradition in Harlem had come downtown to Judson Church in Greenwich Village to perform alongside the early postmoderns?" Rather than illustrating a historical fiction, Harrell uses this proposition to rethink our contemporary context. What we see was neither possible at the voguing balls nor at Judson Church, but a third possibility is created, here and now. This jr. represents a potential uni-size in the series, both unique and unisex.